Discussions Magazine Music Blog: SPAZ reviews THE SWEET! When I was a 9 year old, “Little Willy” by The Sweet was a hit single in the U.S. Oh, how my friends and I laughed at that song whenever it played – ‘willy’ was a kid’s nickname for his…err…willy! So, being 9 and years away from any type of maturity, “Little Willy” was just a funny song, period! Oh, it was also catchy as hell. The Sweet were a British quartet -Brian Connolly, Andy Scott, Steve Priest, and Mick Tucker - that emerged at the tail end of the Bubblegum era and right before Glam took over the UK charts. Perhaps they were the first true Bubbleglam band? A musical vehicle for the songwriting skills of hitmakers Mike Chapman and Nicky Chapman, these four talented Brits played energetic, lightweight Pop with an edge. Not yet the hard rockin’ band they began when they altered their name to Sweet and left Chapman & Chinn in the dust, they were certainly a confident outfit at this point (some of the tracks featured other musicians but The Sweet prove they were more than capable on the rest). 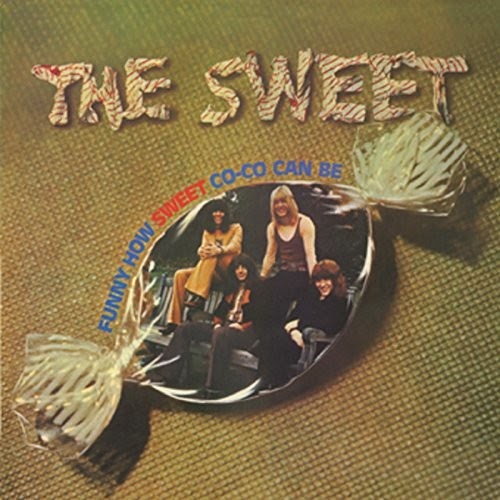 The songs on Funny How Sweet Co-Co Can Be, their 1971 debut album, are pure Bubblegum Pop gems – mindless lyrics and music that always seemed to bounce joyfully around the room. “Co Co” and “Funny Funny,” the two biggest hits from the album, are two prime examples. However, there isn’t a bad track out of the bunch. It may have been Bubblegum, but it was the tastiest damn Bubblegum you could ever wrap your ears around! Even their cover of The Supremes’ “Reflections” is ace. The production on the album is surprisingly full and lively, with tracks that practically leap from the speakers. This expanded edition features an additional 9 bonus tracks including post-album singles like “Alexander Graham Bell,” “Poppa Joe,” and the aforementioned “Little Willy” plus impressive non album tracks that were penned by the band and prove them to be a lot edgier than the their early hits would lead you to believe. In fact, the roots of their Desolation Boulevard album were certainly planted this early in their career. Disc Two of this release is subtitled The Early Years and features eight late ‘60s and early ‘70s tracks that run the gamut from Psych to Bubblegum. This disc not only offers a nice look at their pre-fame recordings, it also shows the band were always a force to be reckoned with.